Music doesn't lie. If there is something that needs to be changed in this world, then it can only happen through music. Hi, I am happy to be a part of the team at Crestwood Music and Arts. I have over fifteen years teaching students of all ages. 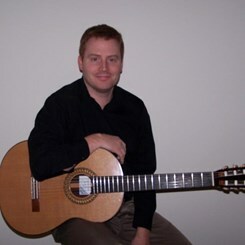 I hold degrees in Guitar Performance from Northwestern University, and Southeast Missouri State University. My goal is developing the student's musical education through instrumental instruction. I believe that with proper technique and musicality, the student will develop a greater appreciation of music and a love for their instrument. I incorporate a variety of resources in my lessons including printed and digital media. I also enjoy arranging pieces and many of my students have performed them in recitals. Regardless of the style of music you choose to pursue, lessons should always be fun and challenging. While pursuing my graduate degree in Chicago, I had the opportunity to perform in multiple theater performances in the orchestra pit. I have performed solo, with ensembles, and accompanied vocalist and solo instrumentalist. Session work includes recording guitar, bass, and mandolin parts with orchestra's, bands, and solo artists. Now I'm back home in St. Louis and ready to continue the musical journey. Request Lessons with Jason today!